There is no way anyone would deny that having a baby changes your relationship. We fully expect things to be a little different between you and your partner as you wade your way through the sleep deprived early days. You grow stronger, you help each other and you spend a ridiculous amount of time together blundering along. But what about the rest of your social circle? Your friends from school, university or work. If you’re anything like me then you may find it a struggle to maintain all your relationships to the same level they were at before. It doesn’t mean we don’t want to be friends, it just means our priorities are a little different. I know I haven’t spoken to some of you in a while. For a few it’s been a day or two, for others its been a month or more. Sorry about that. Babies can be time consuming little things. I often read your message but then forget to respond for quite a while, or at all. It’s not intentional. I promise! I’m sorry we don’t hang out very often anymore. My day tends to grind to a halt around 5pm when I give Piglet his tea and then start to wind down towards bedtime. Evenings are pretty much out as far as socialising goes. I’m sorry that if I can’t get childcare I don’t want to come out and “just bring the baby”. It’s not that easy unfortuneately. It doesn’t make it as fun for me, as I’m constantly watching him, making sure he’s got everything he needs and that he isn’t touching things that he shouldn’t. Going out for lunch is not the fun leisurely event that it used to be. I can’t afford to have 3 courses, take my time and chat a lot. It’s a case of sitting, feeding Piglet and entertaining him and trying to find a spare minute to toss some food in my own mouth. I then want to get out of there before Piglet has a meltdown about being stuck in one place – or often the meltdown has already started. I’m sorry that when I do get to come out that all my conversation seems to revolve around the baby. It’s not intentional. I spend all day every day with him. I don’t have a job, I don’t go anywhere. His milestones and anecdotes are all I know. You’re all really polite and at least pretend your interested, even though I’m sure I bore you. So thank you. I do have some requests though. Please don’t keep saying “it must be nice for you to be out without the baby”. Mum guilt is a terrible thing, so no. It’s not always nice to be away from him. Believe it or not I actually quite like my son. I enjoy spending time with him, I love his personality, I even love him when he won’t sleep and is being a menace. Being away from him for an hour or 2 is nice, but any more than that and I’m generally ready to go home! Please don’t tell me that I make it look so “easy”. I’m sure you mean this as a compliment, but it feels like you are de-valuing the work I put in to caring for my son. Being a parent is not easy, it is incredibly hard. But it is also incredibly rewarding. Sometimes though, I’d just like someone to say “wow that seems so tough, but you cope really well”. Thats more likely to give me the warm and fuzzies. One day, Piglet will be grown. He won’t need me so much, and I’ll have more time on my hands. Fun Kim will be back then! Or maybe you’ll have a baby, and our kids can have play dates. I hope you understand. I hope you haven’t taken offence. And I hope we meet for a glass of wine soon! This post first featured on Meet Other Mums. 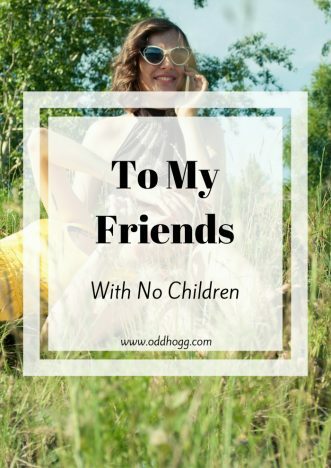 It can be hard with friends without kids. Unfortunately you never really get it until you have them. Oh yes, I always feel so bad when I have to interrupt a friend to reply to my toddler who is pointing out the tenth car / dog / tree he’s seen. ‘Yes it’s a car / dog / tree!’ He doesn’t like to be ignored, and my rude interruption is better than the tears that would result if I didn’t, but that’s hard to explain! I love this. I found it difficult when D was a newborn to go out because I was so stressed but I wish now I’d done it more because going out for food with a newborn is a damn sight easier than with an 8 month old who wants to be everywhere and eat everything. It’s difficult to keep in touch when your days go so fast as well. Oh bless you, should never have to apologise for having a child and why things are different lovely. That being said you should definitely embrace being away from him more than a couple of hours….it is liberating haha. Thanks for linking up to the #bestandworst hope you’ll stop by again tomorrow!